In a sultry late afternoon in February this year, a company of local field naturalists first gathered, then dispersed, as they do at the same time every year, to visit local farm dams for the annual count of the Glossy Black Cockatoo. There they sit quietly and, as best they can invisibly, on the dam walls to hopefully sight these beautiful and sadly endangered avians as they arrive to drink. This, like almost all seed-eating birds, they must do daily. There can be long periods of just sitting around and waiting at these sojourns! The problem here is that that there are far too many of these precious water storages in the area to cover by the small number of birdwatchers available. However, experience informs the group which dams are more likely to enjoy a visitation. When the cockatoos are in this position of vulnerability they are extremely cautious in their approach. A designated ‘cockatoo’, to use the Aussie vernacular, a word derived from two-up games in the early 20th century, provides a lookout for the other birds to drink safely. As well, the watchers sedulously record all other bird species sighted on the afternoon (from about 5 to 8pm) as part of a general data bank of the area. And some rare and beautiful feathered visitors have been sighted; from your correspondent alone this February, these have included: Diamond Firetail; Barking Owl; Spiny-cheeked Honeyeater; Turquoise Parrot; Bar-shouldered Dove; White-browed Babbler; Darter; Australasian Grebe; and many more. Actually, the Narrandera ‘cocky count’ is one of three conducted at this time of the year in the region, the other two being, on consecutive weekends, at Rankins Springs and Leeton. Many ardent birdwatchers attend all three counts. Apart from being rare, hence difficult to spot under normal circumstances, the majestic “Glossies” are unique and remarkable birds. They nest, each winter, in large, sky-facing hollows in old eucalypts, many long dead; the nest chamber snugly lined with masticated wood pulp. The female remains in the nest throughout incubation, being dutifully fed and watered by the male once every afternoon. Following the hatching of the single chick, both parents raise it to fledging, where it joins the family group for its hopefully long life in the sunny uplands of the Narrandera Ranges – and elsewhere in inland Eastern Australia. Parental instruction even begins inside the nest. The chick is oddly born lacking the typical cockatoo beak curve, so the parents teach it to abrade the bill down to the right shape to, in time, extract the tiny seeds from the tough cones of its main food source, the She Oak, or Casuarina. It is this exclusivity of nutrition which has contributed to the bird’s declining numbers over the last two centuries - a diminishing also of course due to land clearing and other environmental pressures. Conversely, the success of, say, its omnipresent cousin, the Sulphur-crested Cockatoo, is largely attributed to its omnivorous appetite. This assertive bird has actually flourished with the spread of human settlement, including in cities. At least with the Casuarina, there is little competition, as almost no other bird can extract the fine seed from the adamantine but beautifully patterned cones. The equation then is simple; preserve and even increase the Casuarina stands and the Glossy Black will be safe. As well, the large, old nesting trees must also be protected from fire, bulldozer and chainsaw. Sadly it takes a gum tree about 150 years to reach a size large enough to accommodate the capacious nesting hollow of the Glossy Black Cockatoo. To help compensate for the loss of nest trees, many artificial nesting hollows have been hoisted up into tall trees in the area in the last few years. Their success is still being determined. Of course a large community of other birds also depends on tree hollows for nesting, including most parrots, Kookaburras, Dollar Birds and owls. Similar to all black cockatoos, such as the Red- and Yellow-tailed Blacks, our Glossies - again unlike the raucous Sulphur-crested - have a sweet, melodious call. In fact one is more likely to find them in the bush by listening for the crackling sound as they feed in the Casuarina canopy – or even by one being sprinkled by their falling detritus! Naturalists the world over count certain species of large animal in the wild by the individual’s distinctive markings. For instance, the spots of a particular Whale Shark (or Tiger, Manta Ray, Giraffe, etc.) are photographed and entered into a computer database. If the giant fish has been recorded elsewhere, the spot pattern can be matched; hence information on its migration, population numbers, et alia, can be increased. The female Glossy Black has such a distinctive ‘fingerprint’, in this case the yellow face markings, which become brighter as the bird matures. The two sexes can also be identified by the female having black bars across the scarlet-red tail. 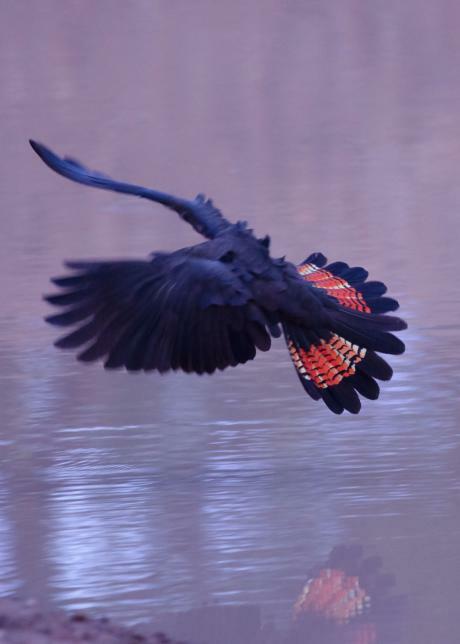 As a result, the ornithological community is calling for photos of female Glossy Blacks (including time and place) to increase the database to add to our knowledge of this iconic bird; one especially important for Narrandera, it being a kind of faunal emblem of the town. The information gained helps in instituting protective measures for its continued survival. And if the numbers from the Cockatoo Count of 2018 are an indication, survival is looking pretty good, with over 140 birds counted at the three localities this February. And in the spirit of modesty, your correspondent (with his ever-patient wife Susan) recorded the highest single location count of all. At a vista-blessed farm dam between Narrandera and Leeton, the couple were astonished to be visited, over the space of just a half hour or so, by no less than 21 Glossy Black Cockatoos as they wheeled in to drink.